BMW X6 2012 unveiled | What Car? 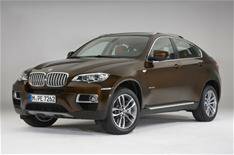 The 2012 BMW X6 has been revealed with updated looks and a new M Performance model. The updated BMW X6 BMWs sports activity coupe gets a subtle makeover, with a new look for the front grille and foglights. Bi-xenon headlights are standard, but adaptive LED headlights are a new option. There are also new rear light lenses, while three fresh metallic colours Orion Silver, Midnight Blue and Marrakesh Brown are available. Two new leather upholstery options have also been added. The range-topping X6 M gains adaptive LED headlights, blue aluminium brake calipers and a powerdome bonnet. The engine line-up is carried over from the current X6, but a new X6 M50d model joins the range. It shares the same tri-turbo diesel engine as the closely related X5 M50d. Both models are the first in a new range of BMW M Performance models. Prices for the 2012 X6 start at 46,725 for the xDrive30d and rise to 85,680 for the X6 M. The updated range will be available to order soon, with first deliveries in June.